I am a Pokemon Professor who is looking to train potential Pokemon Trainers to become the next Pokemon World Champion! 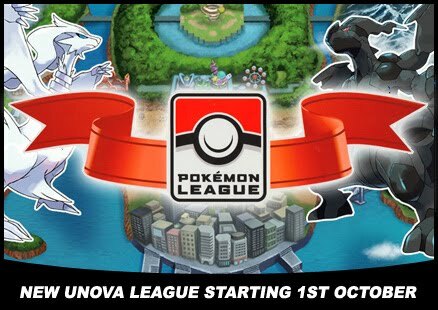 The New Pokemon League 2011 - 2012 Season starts this weekend. Free Entry Gift: Pokémon TCG Promo Cards for Registered Players who completed their admission! While Stock Last! [ ] Black Star Promo Cards numbered HGSS01 + BW01 and higher. In this format, Players will have to play a number of Swiss rounds appropriate for the number of players in attendance. Players are paired against other players with the same, or similar, match record. After the initial swiss rounds, the top-ranked players are seeded into Single Elimination Rounds where players are removed from the tournament after they lose one match. They will play until only one player remains and that player is the winner of the tournament. Age Separated Swiss is, essentially, three separate tournaments, with players in each age division being paired only against other players from the same age division, though the final results of the event are reported as one tournament. The total number of swiss rounds and the number of top players that will proceed to the Single Elimination Rounds will be announced at the event briefing before the start of the Tournament. We have imposed a time limit per round in order to run the event smoothly. If a match has not ended by the expiration of the round time limit, a winner must be determined without delaying the tournament for an unreasonable time. If time is called during a player’s turn, he or she completes the current turn, we will then add 3 more turns. This is three turns combined not three turns for each player. This will mean that the player who is not active when time is called will get the last turn. Use the following criteria, in order, to determine the outcome of a game that is unfinished after the three turns. After one of the criteria has been met, none of the others are applied. (1) If one player was late to the match or was away from the match, without a judge’s permission, for any period of time during the round, that player loses the match. The judge must have been made aware of this absence in advance of the end of the match. If both players meet this criterion, ignore this tiebreaker. (2) If both players were on time to the match and were not away from the match for any period of time, the judge determines the winner based on the number of Prize cards that each player has remaining. The player with the fewest Prize cards remaining wins the match. (3) If both players have the same number of Prize cards remaining, the current game continues, starting with any in‐between turn effects that take place after the last completed turn, if necessary, until a Prize card is drawn. The player drawing the next Prize card is considered the winner of the match and the match ends. If time is called during a player’s turn, he or she completes the current turn, Use the following criteria, in order, to determine the outcome of a game that is unfinished after the time is called. After one of the criteria has been met, none of the others are applied. (4) During the 2nd Game, if neither player did not take 4 or more prize cards, that game is invalid and the winner of the first game will win the round. (5) If time is called during the 2nd game and the score is tied with each player winning one game each, the round will go into sudden Death, where players will start a new game playing for only one prize cards. Every player who participates in a Premier Event during a tournament season has a Premier Rating which can be viewed in your Pokémon Trainer Club account on the Official Pokemon Website. Click here to learn more about Premier Ratings. Starting from this year, all invitations to the Pokémon World Championships are now awarded via Championship Points, awarded to players based upon their finish position at individual events. Click here to learn more about Championship Points. o This Tournament is opened to any player who has a Legal Modified Pokémon TCG Deck. o Players 10 years old or below must have their parent's consent before signing up. o Registered Players are expected to report to the venue from 10:00 to 12:00 on the event day for admission. o Please fill in your decklist (download) and submit it during admission. o Players who are not in line for admission by 12:00 will be given a first round loss. [ Important Information ]o There is a total limit of 120 player slots available for this event due to limited venue space. First come first serve basis. More details and updates will be announced on our Website / Forum / Facebook Page. Thank you for your understanding. INFORMATION : Maxsoft Pte Ltd and Pokémon Organized Play reserves the right to publish tournament information including but not limited to the items listed above, transcripts, audio and/or video recordings or other recounts, player penalties, awards, or any other resultant information from the tournament. TARDINESS : Players are expected to be present for the start of a tournament and each of its component rounds and matches. Players arriving more than 5 minutes late for any round will receive a match loss for that round. Players who are still not present by the end of that round will be dropped from the tournament. UNRULY BEHAVIOR : Players are expected to behave in a respectful manner to all attendees and staff of a Pokémon TCG event. Players who don’t behave properly will be reminded to with the issuance of a penalty. Examples of Unruly Behaviour includes, Shouting and behaving in physically threatening manner, failure to comply with the instructions of the event staff, attempting to manipulate a match through intimidation or distraction. ELECTRONIC DEVICES : with the exception of devices necessary to participate in an event, such as cell phones, MP3 players, or text-messaging devices, are not to be used during a match. In some special instances, an electronic device may be allowed by the Tournament Organizer. FOOD & DRINKS : are not permitted on the play surface. The Tournament Organizer may allow food and/or drinks in the tournament area, but at no time should food or drinks be kept on the play surface. WAGERING : or gambling on the results of a game, portion of a game, match, or number of matches by anyone, including players, tournament staff, and spectators, is strictly prohibited. Anyone attempting to wager on a POP tournament should be removed from the tournament site, and the incident should be reported to POP. HAND ELEVATION : To avoid the perception of impropriety, players should keep both hands above the level of the playing surface at all times. A player’s cards should never go below the level of the playing surface during a match. TOKEN & COUNTERS : Players are required to provide their own counters to mark damage to Pokémon in play and counters to represent Special Conditions and other game effects. A judge may disallow the use of markers that cause confusion with regard to the state of the game or that are offensive in some manner. RANDOMIZER : Players can only to use the transparent, round edged, six sided dice or a Pokemon Coin during this event. MARKED CARDS : Players are responsible for ensuring that their cards are not marked in any way. A card is considered marked if it bears something that makes it possible to identify the card without seeing its face, including scratches, tears, discoloration, bends, and so forth. If a player’s cards are sleeved, the sleeves are considered to be part of the cards, so the cards must be examined while in the sleeves to determine if there is a marked card situation. Cards with different backs or a different cut from the other cards in a deck are not considered marked as long as the entire deck is placed in non-marked, completely opaque-backed card sleeves. The Head Judge is the final authority in determining whether a card or sleeve in a player’s deck is considered marked. REPRINTED CARDS : From time to time, cards printed in previous sets are reprinted in a new set. In most cases, the mechanics of the card remain unchanged, though the wording may be slightly altered for clarification. However, in a few rare cases, the game play text of a card is significantly modified. In these cases, the player must have the English or local‐language version of the card, outside of his or her deck, for reference. FOREIGN CARDS : Players are not permitted to use foreign cards at this Tournament. FAKE CARDS : Only genuine Pokémon TCG cards may be used in Pokémon Organized Play events. Any fake, reproduced, or counterfeited cards must be removed from all players’ decks before the start of the tournament. Those that are not may be subject to confiscation by the Tournament Organizer. PROXIES : Player made proxies are considered to be fake cards and should be treated as such in all ways. Players should ensure that the cards in their decks are in good condition before attending a tournament. DECK REGISTRATION : Before the first round of a tournament, deck registration will occur. This process involves each player listing the exact contents of his or her deck. To make deck registration easier on the tournament staff, players should sort their decks to match their deck lists prior to registration. These deck lists can later be used by Tournament Organizers and judges to verify that a deck has not been altered since the outset of a tournament. Players are not allowed to change their decks at any time during a tournament. DECK CHECK : Deck checks will be performed anytime during the Tournament before or after a match has been played. players should be required to put the cards in their decks in the same order as the cards on their deck lists to speed up the process. PENALITIES : Should an issue arise at a POP tournament, players and spectators will be subject to the Pokémon Organized Play Penalty Guidelines. All penalties above Caution level will be reported to POP for further review. Penalties issued to spectators may be assigned to the player or players that they are responsible for, if severe enough. The Head Judge has the final say on all penalties issued at a tournament. POP GUIDELINE : regarding Pokémon Organized Play Rules and Regulations can be found here. We suggest you read through the entire document to farmilarize yourself with it. Welcome to the Pokémon TCG BW Next Destinies Tournament information page. Please take your time to read through all the details. If you have any questions, please reply to this post, or email us. o This Tournament is opened to everyone. o Players of all ages are welcome. Players below 10 years of age must be accompanied by their Parents. o Please be present at the event venue one hour before the event starts. o Registration is First Come First Serve. Late-comers will not be entertained.o Please bring along your Pokémon Trainer ID card if you have one. New Players will be issued one before the event. At this event, every player will receive 6 BW Next Destinies Booster Packs at the beginning of the event. Each player opens all of his or her booster packs at a signal from the Judge and constructs a 40‐card deck using only those cards and any basic Energy provided by the Organizer. Players have 30 minutes to construct their decks. Decks may contain more than 4 copies of a single card, as defined by the card’s English title, with the exception of cards which are limited to one per deck by card text. Matches are then played for 4 Prize cards instead of the usual 6 Prize Cards. Players may not trade the cards from their booster packs with other players until the Tournament ends. Consolation Prizes are only given to player who completed all rounds of competition. Players will play against opponents matched up by using the Swiss pairing method which determine a single winner by pairing players with the same, or similar, match record against each other until there is only one undefeated player. The first round match-up is determined by random. Depending on the age group of participants for this Tournament, the Tournament Organizer may separate the players into groups according the the Pokémon Organized Play's Age Division. INFORMATION Maxsoft Pte Ltd and Pokémon Organized Play reserves the right to publish tournament information including but not limited to the items listed above, transcripts, audio and/or video recordings or other recounts, player penalties, awards, or any other resultant information from the tournament. TARDINESS Players are expected to be present for the start of a tournament and each of its component rounds and matches. Players arriving more than 5 minutes late for any round will receive a match loss for that round. Players who are still not present by the end of that round will be dropped from the tournament. UNRULY BEHAVIOR Players are expected to behave in a respectful manner to all attendees and staff of a Pokémon TCG event. Players who don’t behave properly will be reminded to with the issuance of a penalty. Examples of Unruly Behaviour includes, Shouting and behaving in physically threatening manner, failure to comply with the instructions of the event staff, attempting to manipulate a match through intimidation or distraction. ELECTRONIC DEVICES with the exception of devices necessary to participate in an event, such as cell phones, MP3 players, or text-messaging devices, are not to be used during a match. In some special instances, an electronic device may be allowed by the Tournament Organizer. FOOD & DRINKS are not permitted on the play surface. The Tournament Organizer may allow food and/or drinks in the tournament area, but at no time should food or drinks be kept on the play surface. WAGERING or gambling on the results of a game, portion of a game, match, or number of matches by anyone, including players, tournament staff, and spectators, is strictly prohibited. Anyone attempting to wager on a POP tournament should be removed from the tournament site, and the incident should be reported to POP. HAND ELEVATION To avoid the perception of impropriety, players should keep both hands above the level of the playing surface at all times. A player’s cards should never go below the level of the playing surface during a match. TOKEN & COUNTERS Players are required to provide their own counters to mark damage to Pokémon in play and counters to represent Special Conditions and other game effects. A judge may disallow the use of markers that cause confusion with regard to the state of the game or that are offensive in some manner. RANDOMIZER Players can only to use the transparent, round edged, six sided dice provided by the organizer during this event. PENALITIES Should an issue arise at a POP tournament, players and spectators will be subject to the Pokémon Organized Play Penalty Guidelines. All penalties above Caution level will be reported to POP for further review. Penalties issued to spectators may be assigned to the player or players that they are responsible for, if severe enough. The Head Judge has the final say on all penalties issued at a tournament. OTHER STANDARD RULES AND REGULATIONS APPLY!